Anyway, in Reset, the episode of Torchwood that went out on BBC3 straight after Adam, he was anything but nice old Jim Robinson. Dale plays Aaron Copley, an ambitious research scientist who heads up the Pharm, a medical research company that have developed a drug called the Reset, that can cure any known disease instantly. Torchwood start investigating Copley and the Pharm after a random selection of people start turning up dead – with their medical records wiped. After some investigation they discover that one victim has been cured of his diabetes, and another person having survived her attacker claims to have been cured of HIV. By this point, Torchwood have already called in the cavalry, in the form of Martha Jones, who has now completed her medical degree, and thanks to the Doctor it seems, is now a medical specialist for UNIT. Working with resident medic Owen, Martha and he discover that the miracle cure is thanks to an alien parasite that hosts it’s larval form within the human body – a larval form that cleanses the body of anything harmful in order to protect itself. Unfortunately, the larval form eventually develops into a giant insect – hence the Pharm is going around assassinating the former test subjects and wiping their medical records before the insect aliens hatch. The Torchwood team pay a visit to the Pharm, detecting vast numbers of alien creatures on the site – and opt to send Martha in undercover to obtain more information. In some ways the episode explored a similar theme to Meat in that it was showing humans exploiting aliens for their own gain – this time for medical and scientific advancement. What is interesting to note though is the change in Jack’s attitude this time around. 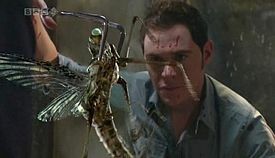 Whereas in Meat he was very much for saving the giant alien whale, and seemed genuinely upset when Owen kills it out of mercy, this time Jack’s plan when faced with a research lab filled with exploited and in Jack’s words tortured aliens, he instead opts to destroy the whole facility, killing all the aliens in the process. The big difference though is that in Meat the alien creature is being exploited purely for the financial gain of the humans involved. Here, Aaron Copley argues for the higher purpose – that the ends justify the means – as he is exploiting the aliens to provide cures for incurable diseases, to help humanity.